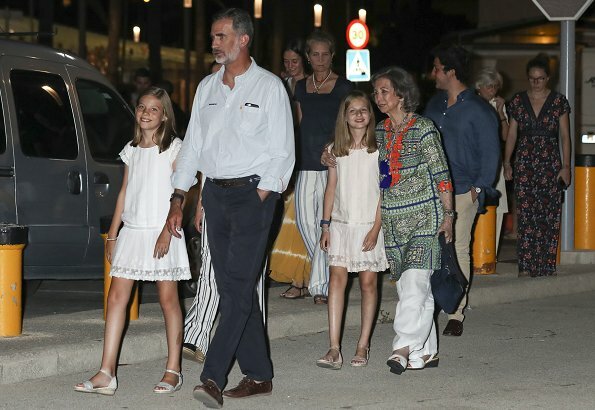 In the evening of August 04, Spanish Royal Family, that is, King Felipe, Queen Letizia, Princess Leonor, Infanta Sofia, Emeritus Queen Sofia, Infanta Elena and their children Felipe Juan Froilan and Victoria de Marichalar y Borbón came together for dinner at a restaurant in Cala de Portixol, Palma de Mallorca. Letizia and Elena are wearing very similar trousers. I like their style. Everyone looks good. 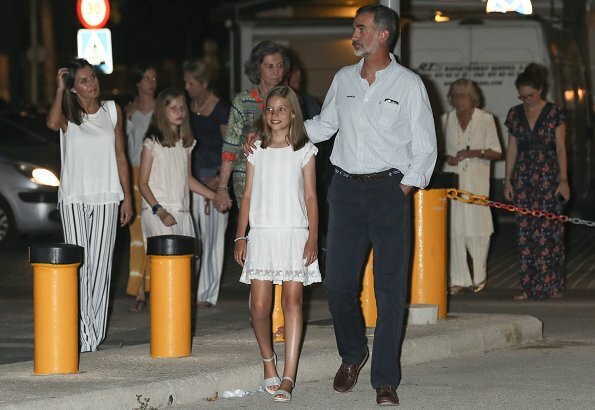 The girl's dresses are so cute, but Sofía (the former Queen) looks like she came out in her pajamas. She's still grabbing on to Leonor for dear life. If she needs support, there are five other adults or young adults present to help her. Let Froilán help her, or her daughter, but free Leonor! En el barco, otra vez Leonor buscó la mano de su padre, que tuvo que dársela. Si Doña Sofía le da la mano, es porque la niña lo necesita, casi nunca va suelta. También es una manera de hacer ver que la ha perdonado el manotazo. Leonor busca a su padre porque es su modelo, su guía y SU PADRE. Ya mostró claramente que no le gusta el agarre de la abuela, pero se lo están haciendo pagar caro, pobre criatura. # Free Leonor! What's with Sofia always holding one or both the girls hands? They're not babies anymore. I have the same ?. If I was the girls I would dread meeting the former queen for public outings. It’s weird! Bueno, el manotazo fue en marzo o abril así que ya está bueno con la penitencia. Creo que hay una indudable diferencia entre el que la chica le de la mano al padre voluntariamente (y el padre normalmente se la suelta tan pronto puede) que el agarre de tenazas de la abuela. Lo importante es que cuando la niña está suelta y anda con su hermana se la ve contenta, no tímida ni temerosa. Es como un garfio la abuela. Si es tímida lo mejor es animarla empujándola a la independencia, no agarrándola la abuela como si se pudiera perder. No sé, no lo veo bien y se ha convertido en motivo de discusión internacional, por lo cual no le hace bien a la niña misma. La ex-reina tiene ahí a 4 nietos ¿por qué sólo siempre agarra a la heredera? Porque así se asegura seguir en el centro de atención. han pasado 4 años y no asume su papel secundario. JC era el rey y sí lo hizo. Angie and Lisa Paris, unfortunately I do not read Spanish so put your comments into google translate to read in English . 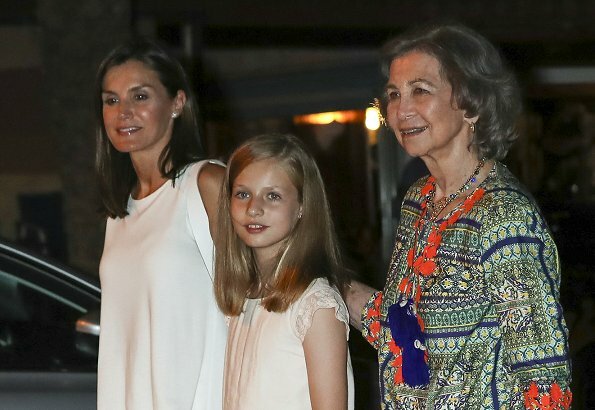 Question: is Queen Sofia's hand holding and marked preference for Leonor remarked upon in Spain ? Or is this considered appropriate , normal grandmotherly behavior with preteen girls? Thanks so much for your insights! Lisa, things do get lost in translation, but there. was. no. slap.Sofia was leaning over the two girls in Letizia's face arguing and moving the children around. The kid probably felt overwhelmed by the acrimony and removed grandma's arm. It is sad that is looks like the child has to assume some of the blame for the incident. This prolonged penance does not look good. What happened to apologize, forgive and move on? She is only 12, too early to become a compliant robot. Sí, las niñas todo el día con el vestidillo, no se cambiaron para cenar. Sí, sí, elegantísima Elena con un pantalón pijama (igual que el de Letizia, oye, jeje), unas sandalias de esparto, una pulseraza de cuero y un collar de perlas enormes con un colgante de medio kg de oro, todo conjuntadísimo, juásss. ¡Y también lleva la misma ropa de la mañana en las regatas! Pero eso os lo calláis ¿verdad? Que se os ve el plumero, haters. Angie, se expresa usted con mucho desprecio. I think here there is nothing new to say. The girls are dressed the same, the former queen is dressed the same, and sadly, she still has an iron grip on one of the girls. And for many, it is very distracting to see this appearance after appearance. The chemise style looks nice on the young ladies. Yes, free Leonor, but not from her loving grandma Sofia, but from her overcontrolling mother. And by the way: Queen Sofia is still the most respected and liked member of the Spanish Royal Family. That being the reason that she still has to attend official events and to show, that te^he family is still reunited despite the Palma affair. Interestingly, it was the intern housephotographer of the Casa Real who wanted to take a photo of Queen Sofia together with the girls inside the Cathedral of Palma. Firstly, Sofia is the former queen. I don't understand why she is refered to as queen. There can only be one. Maybe that can be explained to me. Secondly, if Sophia has no confidence in her son knowing how to bring up the future heir, then the failure is hers and Juan Carlos'. We all do our best to bring up our children to be the best people they can be. When they reach a certain age, we must let them fly alone and watch the fruits of our labor. She needs to trust her son, and certainly be there when her advice is sought. There is no need for her to hang on to Leonor at this age. Either of the girls for that matter. They are being brought up in the way their parents see fit, and in no way do Felipe and Letizia want their girls to be on display when unnecessary or suffer because of their position in life. The former queen invites this into their lives over and over again. Everything they do does not have to become a photo op. Whether it is true or not, it looks like she is using the girls to make herself relevant. Lastly, I don't see how anyone could think the family is not united. She is on vacation with them. She is with them quite often. I am certain that could be cut off if Felipe chose to do so. I think she overstepped on Easter and she was called out for it by Letizia. Leonor was tired of being touched and wanted all hands off of her. Good for her! Of course there will never be an official explanation because it would only add fuel to the fire. The former queen should have no say in what the girls do and do not do. She has had her children, now she needs to step back. The only people who make the decisions for the girls are their parents. Period. And if the intern house photographer was involved on Easter, he should have known better. You say the former queen HAS to attend official events since Easter. She was attending official events from the beginning, and attends events independently as well. Your arguement doesn't make any sense to me. We certainly don't need to agree, but I look at this from a parent's point of view, and how my own children and nieces and nephews would feel. She is overbearing. Chardonn8r: King Juan Carlos, despite his abdication, retains the title of King in an honorary way until his death. This was established by law at the time of his abdication. The same applies to Queen Sofia. So, we have two Kings and two Queens though two of them are just honorary titles. @ 1:15 These girls are always well mannered, groomed and dressed appropriately. Even the critics agree. Leonor deserves to be raised in a supportive environment that will help her to be an effective leader, not be part of a tug of war between adults. She has two parents. Third parties should never have prominence in her life. That an adult who must belong to a family can support taking her from a ‘controlling’ mother is a new low in cruel posts. We only have to look at the princes in the UK who lost their mother twice (separation/death) to see how they have struggled emotionally. If the girls are rarely seen then saying the mother is controlling is repeating information from in the gutter press who invent fake news. Sofia is a consort, and at 80 she is too old to manage girls in puberty. Mothers are controlling, that is what they do. They control what you eat, what you wear, where you go, what friends you keep etc. and many of us are grateful for this in later life. If as it is said, that the grandmother does not see them often, then who is responsible for the people they are at the moment. Maria, many thanks for the explanation! chardonn8r: I agree that the parents have to educate the children according to their own standards and I also have no problem that they are protective over the two girls to a certain extent. But the children and their grandparents have also the right to see each other once in a while. What is so harmful to hold hands with the grandma three or four times a year? Why do you want free Leonor from her? Why all these negative comments? Queen Sofia occupies her role since her husband's abdication in 2014 in her professionalism. I didn't say only since Easter. That must be a misunderstanding. From the outside the relationship between the two queens has always looked positive. But king Felipe makes big efforts to bring them together. No one taught Letizia more about Royal protocol and helped her settle into the royal circle than Queen Sofia. She is still the most professional member of the Royal Family, the one who most respects the protocol and I really don't think Queen Sofia misuses the girls "to be relevant" or whatever you mean by that. Paloma Rocasolano, the mother of Queen Letizia, is a regular visitor to the Royal palace "La Zarzuela", often looking after Leonor and Spohia when their parents are travelling despite the royal household having two full-time nannies and they spend a lot of time together. And Queen Sofia? Isn't she a grandmother as well? I don't really see any need to free Leonor from Queen Sophia and I think she deserves better. @ Chardonn8r With a bit of logical thinking it is presumptuous to assume that the girls only see the grandparents 3 or 4 times a year since they all live in the same enclosure…unless…someone on the inside feeds the press, to feed the gossips. All families have parties for, birthdays, christenings, weddings, Christmas, etc. Since they will be the inheritors in the future it is unlikely that they do not know their relatives and the grandees. Adding Letizia’s mother to the equation implies is that Sofia is a victim. These 2 grandmothers offer different things. Sofia probably teaches institutional things and introduces them to the extended European family which we do not see. Paloma who is much younger can supervise homework, cook dinner, supervise play dates with friends and visit places incognito without the security that would be needed for Sofia. If you were leaving the country, would you feel comfortable with your mother who loves them taking care of your children or rely on strangers who are being paid to do it? The ladies offer different learning experiences which all children need. Paloma is not a threat to Sofia (mother of a king, daughter of a king, etc). The other grandchildren spend time with both families in summer and on important holidays. No complaints from Sofia there. Sofia’s loving grandma photo ops are total look-at-me events. At the Billy Elliot outing, one of the photo agencies shows a picture of the crowd to the left of Letizia (not shown in the regular press) and there are about 100 people holding up their cellphone cameras. Sofita looks uncomfortable, while Leonor offers her hand for holding and smiles, and smiles, and smiles. No hand holding with Irene or VF. Holding hands is not the issue, but holding hands with the heiress in every picture is attracting unwanted attention brought on by the clever intern who made the video viral. It looks like poor Leonor has been doing the stations of the cross since Easter (and Letizia too), a heavy burden of guilt for someone so young. … Free Leonor! @MarigoldB I think you meant to address "Unknown". I want to let you know you are spot on! Kate does the same thing with George, Charlotte and now Louie. Having a loving family member (and commoner) looking after your royal children is certainly preferable to having the paid help watch them. This will keep them grounded. They need be able to have normal childhood experiences and be regular kids. Sophia will never be able to provide that. Both grandmothers have an important role in the girl's lives. Paloma knows her role, Sofia needs to accept hers. And she has got to stop pulling one or both of the girls into her space and smiling for the cameras. If "Queen Sofia is still the most respected and liked member of the Spanish Royal Family" (Unknown, August 7), why not walk out alone and have as many photos taken as she likes, as often as she likes? Or just smile for the cameras even if the girls aren't standing right next to her, but let's say with their parents or off on their own, out of the camera's range. Sophia should worry about the girls resenting her for her actions, especially Leonor. I see Ladies, you show more empathy for Queen Letizia. But still there is no need to free Leonor. Queen Sophia is only occasionally living at Zarzuela Palace. More often she lives outside Spain, in Greece or in London.